Model and serial numbers are key to finding information, getting service and ordering parts for your fireplace, insert or stove. If you haven’t already located them, here’s how. The model and serial numbers are located on a “rating plate,” which is a metal plate that’s usually permanently affixed to the fireplace, insert or stove. In gas fireplaces, the rating plate is found in the controls area. To access it, you’ll need to open or remove the decorative front, and remove the vanity panel, as shown below. 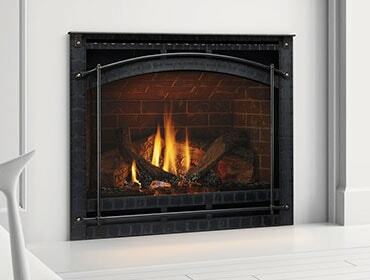 The rating plate is located in the bottom component area of the gas fireplace. You can use a common household flashlight to read the numbers. To find the rating plate on a gas fireplace insert, you’ll access the controls area by lifting off the decorative front, and then removing the vanity panel (pictured below). The rating plate is located near the front – use a flashlight to read the numbers. On a stove, the rating plate is located on the back of the appliance. If your stove is installed against a wall, the rating plate can be difficult or impossible to see. But you can take a photo of it with a smart phone or camera, as shown below. More of a visual person? You can watch a video with these step-by-step instructions.